UT System Chancellor Francisco Cigarroa, responding to a news report suggesting UT-Austin President Bill Powers' job might be in danger, said Thursday that Board of Regents Chairman Gene Powell "never directed me to fire anyone." University of Texas System Chancellor Francisco Cigarroa, responding to a news report suggesting UT Board of Regents Chairman Gene Powell had asked him to fire University of Texas at Austin President Bill Powers, said Thursday that Powell "never directed me to fire anyone." Cigarroa's statement follows a blog post late Wednesday from Texas Monthly Senior Executive Editor Paul Burka. Citing an unnamed source, Burka wrote that the regents are angry at Powers for publicly expressing disappointment with their decision — made with encouragement from Gov. Rick Perry — to reject Powers' request for a slight tuition increase. Burka wrote that Powell asked Cigarroa to officially recommend that they fire Powers, and that Cigarroa refused. The post suggested the board would likely call a special meeting to take action. The report sparked an overnight social media campaign on Powers' behalf. On Wednesday night, as speculation swirled about renewed tension between Powers and UT System regents, the Twitter hashtag #savebillpowers went viral. By Thursday morning, a public Facebook group called "I Stand With Bill Powers" already had more than 7,700 members — though it appeared many of the members had been added by others, not by themselves. A @SaveBillPowers Twitter handle had sprouted, along with a second Facebook page, "Save Bill Powers." Students were imploring one another on social media to bury the regents in emails and phone calls. On Thursday afternoon, Powers released a statement expressing gratitude for the outpouring of support. 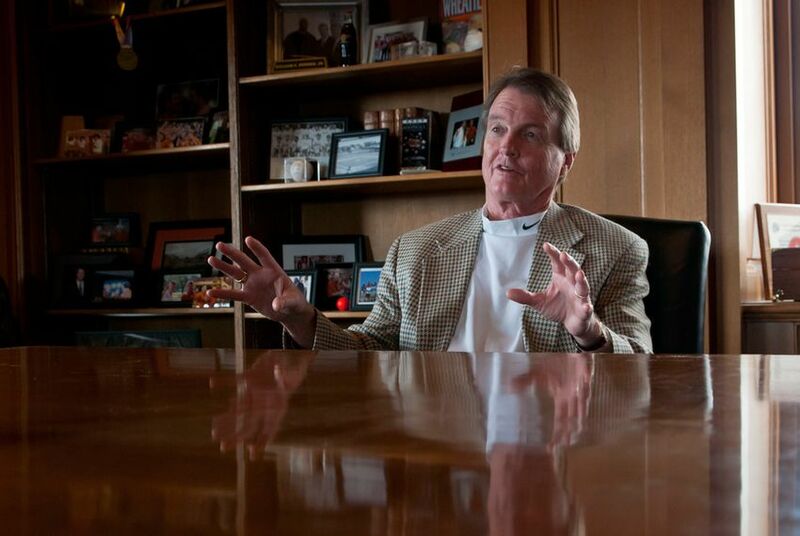 "I will continue to work with the entire UT community to move the university forward," he wrote. "At this moment, I am focused on the more than 8,000 students who will graduate next week and make immeasurable contributions to society — extending the university’s legacy of excellence and our positive impact on Texas." After releasing Cigarroa's statement, officials at both UT-Austin and the UT System declined to comment further. And sources close to the Board of Regents told the Tribune that while tensions have been high between board members and Powers since last week’s meeting, they have simmered in recent days. Though they acknowledged that even board members who have defended Powers have become frustrated with him, they said there is no plan to call any special meeting to seek Powers’ termination. The regents will, however, meet in August for an annual review of the performance of top system officials and campus presidents, including Powers. Whispers about Powers' future at the university have been circulating since last year, when the regents and the leadership of the system's flagship university found themselves embroiled in a tense discussion about how to approach higher-education reform. The waters were calmed significantly, though clearly not permanently, in August 2011 with the unveiling of Cigarroa's "Framework for Advancing Excellence," which mollified both sides. But rifts remained. Less than a month later, in his State of the University address, Powers said, "To paraphrase Lincoln, we are a house divided about our fundamental mission and character." In October 2011, at a legislative hearing of the Joint Oversight Committee on Higher Education Governance, Excellence and Transparency, Powell assured committee co-chairwoman Judith Zaffirini, D-Laredo, that Powers' and Cigarroa's jobs were safe. The senator responded with delight, saying that both men are "very much respected and loved by members of the Legislature." But last week, after the regents approved a tuition freeze over his objections, Powers spoke out again. On Facebook and Twitter, some students have been skeptical of Powers' support for tuition increases. But the overwhelming sentiment, at least in the hours since Burka's blog post, appears to be opposition to a possible ouster. "It's certainly exciting to see young people rallying behind their university president," Jenifer Sarver, a spokeswoman for the Texas Coalition for Excellence in Higher Education, said in an email. The coalition, a group of prominent higher-ed boosters that formed last year to try to prevent reform efforts backed by Perry-appointed regents, was supportive of Powers' tuition request. "We certainly hope these rumors are unfounded," Sarver added. A truer test of support may come from the UT community's response to a recent call issued by the Texas Exes, the university's powerful alumni organization. In a letter, Texas Exes president Machree Gibson urged fellow alumni to contact the regents and encourage them to support the university's current leadership. "We call on the Regents to disavow the published rumor that the leadership of its flagship risks being punished or fired for voicing respectful, measured dissent," Gibson wrote. "Even rumors, when left in play without confirmation or comment, can lead to instability. And instability is a great enemy of achievement."